Weighty Matters: School Superintendent Defends Pushing Ice-Cream on 6 Year Olds for Fundraising! School Superintendent Defends Pushing Ice-Cream on 6 Year Olds for Fundraising! Readers of my blog may remember a few weeks ago when I posted about a local elementary school that offered 6 year olds weekly ice cream sandwich and pizza days. Duly horrified, I wrote the Director of Education of the Ottawa Catholic School Board about my concerns about both the message being sent to children regarding school approval of junk food and about the contribution of such programs and messages to the problem of childhood obesity. My letter was then forwarded to Ms. Diane Jackson, the Superintendent of the School involved. She wrote me back and while you can feel free to read her letter in its entirety here are some salient parts. "It is evident that you are the Medical Director of the Bariatric Medical Institute. Based on the information I read on your website www.bmimedical.ca, my understanding is that your business serves the public, for a fee, in the treatment of obesity and its associated conditions"
Now maybe I'm reading into this paragraph but the inclusion of the words, "for a fee" strike me as a tad odd. Is Ms. Jackson suggesting that 6 months of unlimited one-on-one access to dietitians and trainers along with the use of onsite fitness facilities should be offered for free? Does the fact that my single income from OHIP is unable to pay the salaries of my 9 non-physician co-workers and 4,000 square feet of rent somehow discredit me in her eyes? While it would certainly be nice to be able to offer my office's services for free, clearly that's not possible and I certainly would never feel it important to describe her job as, serving the public, for a fee, in her role as school superintendent. "Your letter expresses concerns over childhood obesity. Apart from expressing your displeasure with one of our schools, I am not clear as to the purpose of your letter"
Now I sure don't recall expressing displeasure at a school but rather at what I felt to be an obscene school program. Regarding my "purpose", I thought it was pretty clear but let me spell it out as bluntly as possible. Using 6 year olds (or any students for that matter) and their love of ice-cream to raise money for your school is not only nutritionally and medically unsound, I would argue that it's also morally questionable given the global awareness of the risks of our growing epidemic of childhood obesity and consequently I am suggesting it is a practice that should end. But who am I? Maybe I'm simply a for-a-fee, crazy, capitalistic nutritional zealot - right? Probably not given that every official Canadian Food and Nutrition Policy statement expressly forbids the practice of fundraising with unhealthy food including those of the Provinces of Nova Scotia, British Columbia, Manitoba, Alberta, Newfoundland and Labrador, and New Brunswick, as well as those produced by the Ontario Physical and Health Education Association and the Ontario Society of Nutrition Professionals in Public Health. "All Canadians have a stake in the health of the next generation of children. Let’s keep out the junk food, subsidize healthy food offerings like vegetables and fruits and monitor the schools’ success in doing both. 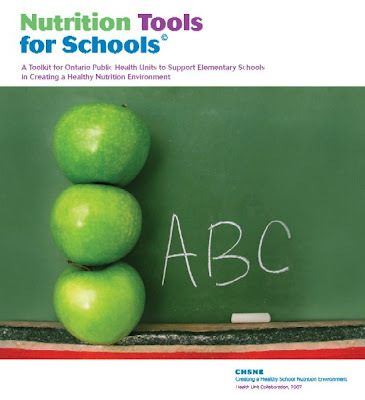 Improving (and enforcing) decent nutrition standards for school foods and better subsidizing nutritious school fare would help children improve their diets and establish healthier dietary practices that persist into adulthood." In that spirit, I'd like to call upon you, my blog readers, to take two minutes of your time to let Diane Jackson know what you think about the practice of a school that fundraises using weekly ice-cream and pizza days to 6 year olds by clicking here to send her an email . Included in your email will be Mr. Jamie McCracken the Director of Education for Ottawa Catholic Schools, Mr. Brian Kelly the Principal of St. Andrew Catholic School and Ms. Joanne MacEwan the Chairperson of the Catholic School Parents Association (CSPA). To avoid confusion, please don't forget to very clearly explain to Diane the purpose of expressing to her your concerns.